How will my child go to sleep? Does he/she need an IV? Typically, an intravenous (IV) catheter is placed in a vein prior to an anesthetic and surgery. This allows medication and fluid administration prior to and during a surgery. For some children, this can be a very unpleasant experience. Therefore, in most cases, we will have your child go to sleep by breathing anesthetic gasses. Once your child is asleep, we will place an IV catheter and proceed with the anesthetic and surgery. What if my child is anxious or scared? 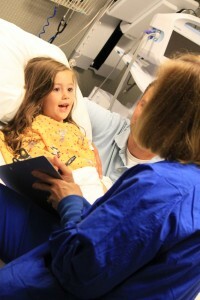 A few techniques are available to help relieve your child’s anxiety prior to surgery. Most commonly, an oral medication will be given a short time before your child’s surgery. Your child will then stay with you until his or her trip to the operating room. The medication not designed to put your child to sleep, but to relieve some of the anxiety of their trip to surgery. What if my child has a cold? This is a very controversial issue in anesthesia. A cold, also known as an upper respiratory tract infection (URI), may increase your child’s risk of respiratory complications during anesthesia and surgery. These complications may be as mild as some wheezing and coughing; to severe as in pneumonia or difficulty breathing. For routine elective surgery, we usually recommend postponement of surgery for some time (usually at least a week or two). If your child has a cold prior to a scheduled surgery, please contact your anesthesia provider or primary care physician.